If you are looking for the best log home care company in the Sedalia MO area, then you are at the right place! 888-LOG-GUYS is the best in log home restoration, log home repair, log home chinking and caulking, log home improvement, and log home maintenance. Our knowledgeable staff will give you the best solution, and our experienced crews will execute your log home solution to your satisfaction! You will be so pleased with how well we serve you! If the stain is peeling off your logs or if your logs are looking bare, then it may be time to restore your logs’ layer of protection. The first thing we will do is use media blasting to remove the old stain. Then, we can sand the logs down to a smooth finish before cleaning the logs with a borate treatment. Next, we will apply an energy seal in between the logs. 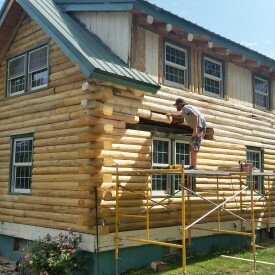 To finish, we will stain the logs and add a topcoat to complete the restoration and preserve your log home! Our crews have seen severely damaged logs in need of repair for many different reasons: log rot, water damage, severe weather, bird damage, or insect damage. 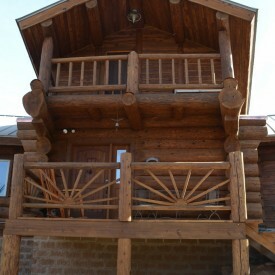 Our company has seen it all, and we know how to fix log homes! Our staff will give you the best solution, and our crew will deliver to your complete satisfaction! 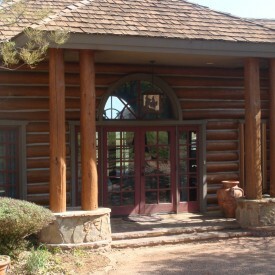 We have repaired logs, replaced severely damaged logs, and even replaced large sections of log walls. With 888-LOG-GUYS on your side, you will never need to worry again about your logs again! 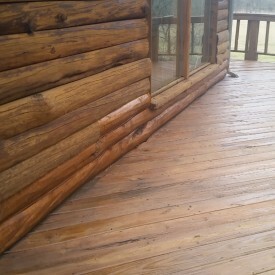 If you have noticed water leaking through your walls, an abundance of insects in your log home, or air drafts coming in around your windows, then you may consider having chinking or caulking applied on your log home, or if you already have an energy seal, then consider having it repaired. Chinking or caulking applied in between your logs will close the gaps that allow nature’s element to enter your home, and it will make your log home a comfy and cozy place. Call our number to speak with an estimator! Have you considered adding any structures to your log home? If so, then also consider 888-LOG-GUYS to build those structures to make your log home even more beautiful and unique! Call our staff or send a request from our website to discuss your log home construction ideas, from building decks, porches, or patios to constructing log staircases to building log railings. You can trust us as we are the best log home improvement company in the Sedalia Missouri area! A log home is unique in how beautiful it looks when it is properly maintained. 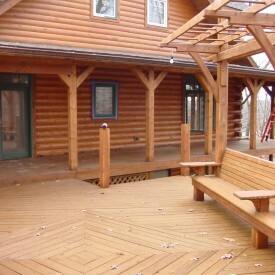 The maintenance process is a process that you need a log home maintenance professional to manage. Leave it to 888-LOG-GUYS! 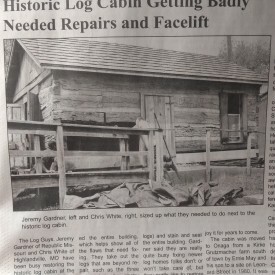 We know what it takes to keep your log home clean and properly preserved. And we will manage your maintenance schedule! Log home maintenance becomes affordable and hassle-free when you have us do the work! Call us today or ask for an estimate from our website!